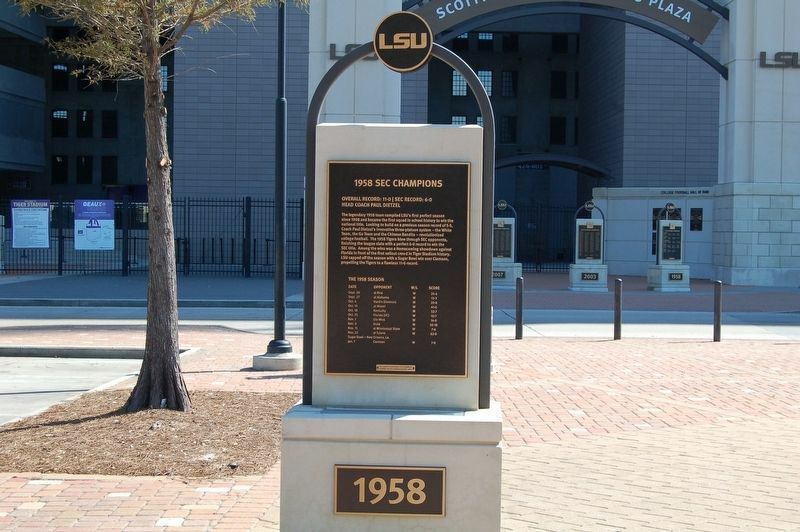 The legendary 1958 team compiled LSU's first perfect season since 1908 and became the first squad in school history to win the national title. Looking to build on a previous season record of 5-5, Coach Paul Dietzel's innovative three-platoon system - The White Team, the Go Team and the Chinese Bandits -- revolutionized college football. 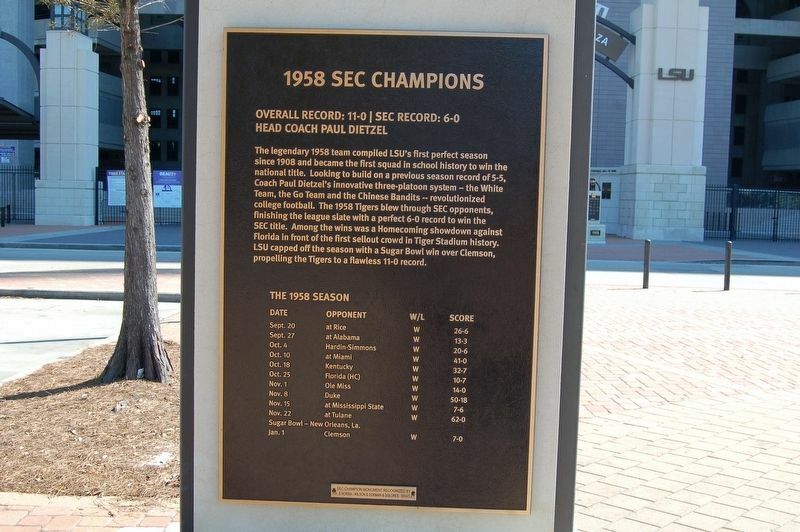 The 1958 Tigers blew through SEC opponents, finishing the league slate with a perfect 6-0 record to win the SEC title. Among the wins was a Homecoming showdown against Florida in front of the first sellout crowd in Tiger Stadium history. LSU capped off the season with a Sugar Bowl win over Clemson, propelling the Tigers to a flawless 11-0 record. Erected by H.H. & Norma - Wilson & Dorman & Delores - Whatley. Location. 30° 24.692′ N, 91° 11.125′ W. Marker is in Baton Rouge, Louisiana, in East Baton Rouge Parish. Marker is on West Stadium Drive north of South Stadium Drive, on the left when traveling north. Touch for map. Marker is in this post office area: Baton Rouge LA 70803, United States of America. Touch for directions. Other nearby markers. At least 8 other markers are within walking distance of this marker. 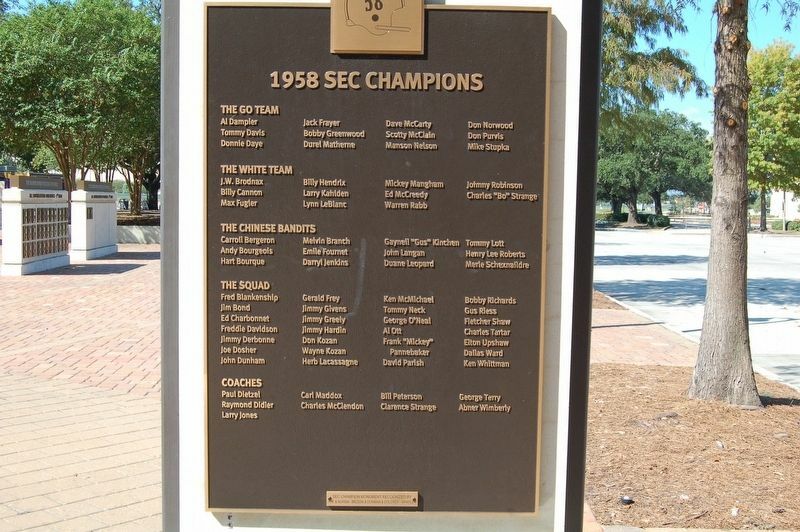 1970 SEC Champions (a few steps from this marker); 1961 SEC Champions (a few steps from this marker); 1935 SEC Champions (a few steps from this marker); 1936 SEC Champions (a few steps from this marker); 1986 SEC Champions (a few steps from this marker); 1988 SEC Champions (a few steps from this marker); 2001 SEC Champions (a few steps from this marker); 2003 SEC Champions (within shouting distance of this marker). Touch for a list and map of all markers in Baton Rouge. More. Search the internet for 1958 SEC Champions. Credits. This page was last revised on October 28, 2016. This page originally submitted on October 28, 2016, by Cajun Scrambler of Assumption, Louisiana. This page has been viewed 209 times since then and 3 times this year. Photos: 1, 2, 3. submitted on October 28, 2016.